Come visit Doraleous & Associates on July 29th 4-6pm EST on the Lightninghoof server in WoW before they return to Nudonia for Season 2! The time of Doraleous and Associates on World of WarCraft is drawing to a close. After downing five drafts of ale, Mirdon ran into a portal trainer and learned how to get the crew back to Nudonia. 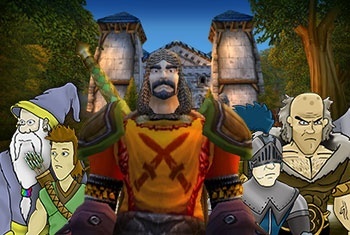 However, Doraleous would like to send his new associates off with a bang and will be returning to Stormwind on Thursday, July 29 from 4-6pm EST on the Lightninghoof server. This time, Doraleous wants to get everyone together for a friendly game of capture the flag with the Horde. Some orc named Garrosh set it up, part of a biannual faction get-together. There might be a three-legged race and a sock hop, too. So, come join us and make sure to keep following our adventures in Nudonia here at The Escapist. Who knows, Doraleous & Associates just may return to Azeroth in the future.